Eight Songs: Oh! Quand je dors; Le chasseur des Alpes; D�abord, j�etais pr�s du d�sespoir; Dans le Rhin, dans ce beau fleuve; Cloches de Marling; Petit ange aux cheveux blonds; Prends un rayon de soleil; Ce doit �tre merveilleux. Souzay admirers have had much to savour in recent years courtesy, to a large extent, of Testament. A good selection of his French repertoire can be found there as can a cross-section of his Schubert, Schumann, Wolf and classical and traditional songs. These are all derived from Decca discs from the 1950s. Some of the early 1950 recordings are on Pearl. 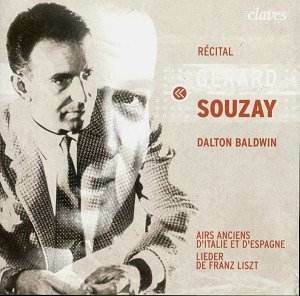 Now from the Swiss label Claves we have another facet of the Souzay-Baldwin partnership from that heady decade: their recordings for Lumen and for Ducretet-Thomson (the Liszt items) of these twenty-eight songs. The repertoire flirts with that which they laid down for Decca at around the same time � Monteverdi and Italian baroque in the main though there was Handel. However the transfer of the Lumen LP has preserved an especially imaginative selection of (mainly) sixteenth century songs from Italy and Spain. It should come as little surprise that Souzay, whose Monteverdi Orfeo was so admired a characterisation, should excel here as well. A number of these Aria Antiche derive from Canzone scordate and were selected and harmonized by Arne D�rumsgaard. They show once more the baritone�s sheer elegance and refinement; never narcissistic, always devoted to the musical line. His legato is sovereign in Cavalli�s Son ancor pargoletta and whilst one could perhaps take a certain objection to the raffin� quality of his portamenti in the Caccini song Tu ch�hai le penne Amore there�s no argument at all about the elastic nature of his control over it; lyric singing of tremendous eloquence. His response to the sentiment of the poetry is at its blazing summit in Carissimi�s Soccorretemi, ch�io moro; listen to the control of the rise and fall of dynamics, the scrupulous attention to the text and the sheer beauty of tone Souzay evinces. Also, lest it be overlooked, how appositely and sensitively Baldwin accompanies him. What in other voices could have been an invitation to braggadocio � Pasquini�s Quanto e folle - becomes instead a witty discourse in knowing manliness. This is a singer who knows his texts and characterises with wit and understanding. This applies to a hunting aria such as Mena�s A la caza, sus, a caza � hardening of the voice � as much as to the honeyed mezza voce he employs in Milan�s Quien amores ten. It applies equally to Baldwin�s languid introduction to de la Torre�s Quien amores ten as to Souzay�s suave legato and their dual exploration of explicit Spanish rhythms. The Liszt songs were recorded slightly earlier, in Paris. The accents and vocal subtleties are just as impressive. Oh! Quand je dors may be quite slow but it�s well sustained and Le chasseur des Alpes has the requisite strength of purpose. The teamwork between the two men in Cloches de Marling is well nigh ideal. So a splendid selection from non-Decca 1957-58 LPs. The recording caught a certain amount of uncharacteristic forcing (try Pasquini�s Bela bocca) and there�s also some high-level rumble as well, especially in the Italo-Spanish selection. But otherwise admirers of the great baritone will be well satisfied, as they will by the full texts and useful introductory biographical notes.